Althea Korea turned 2 last July and it rained blue beauty boxes all over Asia and to countries where Althea Korea ships their products. There were so many surprises in store last July for both K Beauty fans and beauty bloggers who were called Althea Birthday Squad. I'm one of the few bloggers who joined the squad in spreading the birthday cheer. I received Althea’s Limited Edition Birthday Cake Box with DIY cake box deco, a birthday card, and gift pack which consisted of my haul. I only picked three items this time because I still have a lot of K Beauty products to try at home. 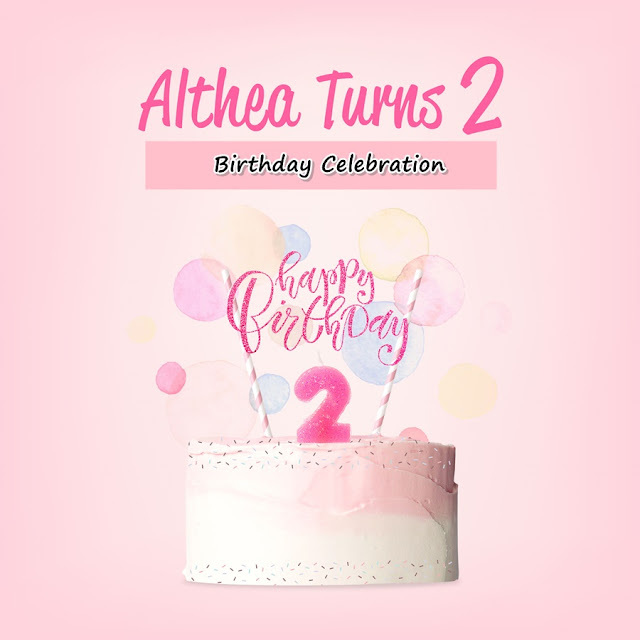 Sharing a short feature of my Althea Korea Turns 2 Birthday Haul after the jump! Limited Edition Althea Birthday Box design that looks like a cake! Instagram #AltheaTurns2 Contest - snap & show your decorated birthday box to win amazing prizes from Althea! Like what I've said in my introduction, I picked three items because I still have a lot of K Beauty products at home to try. My haul consists of two makeups and a skin care. I had a hard time choosing what products to buy because I want them all. Kidding aside, my haul came from brands that I trust. Laneige's award-winning cushions have gotten an upgrade! With an even prettier packaging and new, improved formula, this cushion provides smooth coverage with effortless application. This one comes with a formula that controls excessive production of sebum, leaving the skin looking and feeling fresh throughout the day. This baby also has long-lasting properties to keep it on all day so you won’t have to worry about it budging. These compact cushions make morning routines a breeze, and are great to keep in your bag for touch-ups on-the-go! How To Use: Pop open the cushion and pick up product with the puff provided, then blend onto the skin for desired coverage. Liquid type blusher with milky colors. Lively, vivid blush for that sweet innocent cheek looks. Contains 12 natural ingredients, hypoallergenic, moisturizing, and soothing. How To Use: Apply on apples of cheeks or diagonal and spread. Mild and soft peeling gel made of yogurt. Made with the finest natural ingredients, claims to remove dead skin cells and sebum, condition and improve skin tone and increase the skin’s elasticity. How To Use: After cleansing, apply yogurt peeling gel on the face. Massage for about one minute and rinse with lukewarm water.